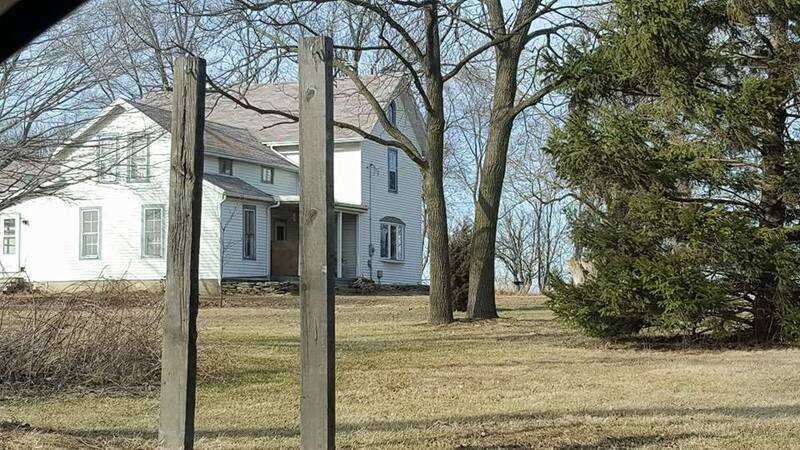 Driving the narrow back roads of Winnebago County in search of small cemeteries is like taking a trip back through time. It doesn’t take much to imagine the way the area appeared one hundred years ago. 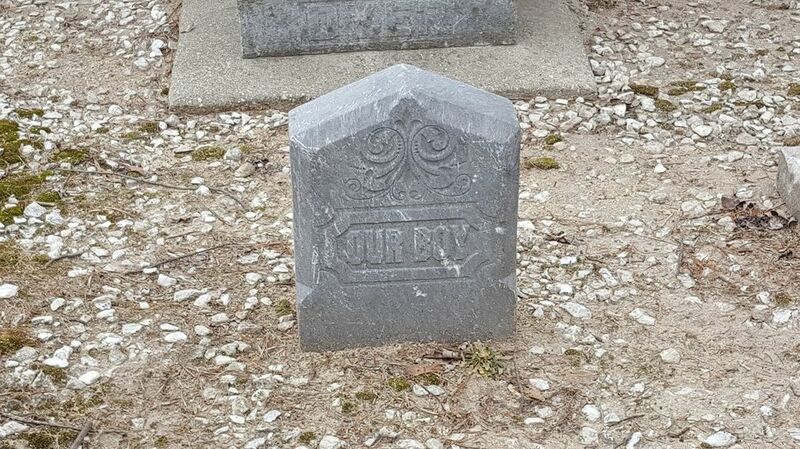 Though some of these cemeteries have been lost to time, Winnebago County has a dedicated group of people who have searched out these obscure graveyards. They have found the locations, cleaned them up, and rescued the few remaining tombstones. The Tripp Pioneer Cemetery is one of these fortunate locations. It lies along Paulson Road (part of which is now known as Paladin Highway) in Harlem township between Harlem Road and Orth Road. Though twenty six to twenty nine names are listed in the records for this cemetery, only a few headstones remain. These have been gathered and placed inside a fence to help protect them. The land for the cemetery was given by a man named Jonas Tofflemire. Jonas donated an acre of his farm for the cemetery in 1842 when David Anderson died. David was an uncle to Jonas’s wife, Sally Sessions. Jonas and his brother John had a very interesting history even before arriving in Winnebago County in 1839. Their parents were Henry and Judith Fox (Fuchs) Tofflemire. Henry fought during the Revolution. He was captured by Native Americans in Kentucky at Ruddle’s Fort and forced to march to Detroit. In 1790, he was given a land grant at Grosse Isle, Canada by King George III for his service to the crown. Henry died prematurely at age of thirty four years old, leaving his wife to raise their two young sons. Jonas and John were both born in Canada and came together to Winnebago County. Jonas purchased 160 acres of farmland in Harlem Township. John’s history was a little harder to trace. He was born in 1794 (or 1796 by some records). He married Mary Stewart and had five children. John died in 1851 and was buried in the Tripp Cemetery. Jonas was better known in the township and his records were easier to obtain. Jonas was born on September 14, 1796. He was trained as a blacksmith but also worked in carpentry. In fact, he would build the caskets of some of his neighbors interred at the cemetery. Jonas was fascinated by astronomy and spent many hours stargazing in his backyard. He used his artistic skills to construct a model of planets and their orbits. Jonas became so well known for this hobby that several professors visited him on the farm. Jonas married Sally Sessions, the daughter of Samuel and Sarah Anderson who also moved to Winnebago County. Jonas and Sally would raise eleven children. Their house and farm still sit on Paulson Road. Jonas lost Sally when she died in 1854 but hopefully it brought him comfort to have her laid to rest on the corner of their property next to her parents and their children who had died so young. Jonas passed away on March 24, 1879. Sally’s father Samuel came to Winnebago County around the same time as the Tofflemire brothers. He bought the property next to theirs and began to farm. Sally’s mother, Jane was blind and when Samuel died in 1872, Sally and Jonas’ son Samuel Findley moved to the Sessions land to farm the land and care for his grandmother. Samuel married Salome Celia Tripp on March 4, 1850. Samuel was considered a very progressive farmer who experimented to improve his crops. Both Salome and Samuel are buried in the small cemetery next to their families. The tallest head stone in Tripp Cemetery bears the name of Horace Dyer. Horace was born in 1817 in New York and traveled to Winnebago County in 1836 with his parents James and Susan. Horace was married to Clarissa Tripp on December 14, 1845. In 1847, he bought land in Harlem township but felt the tug of adventure in 1848 when the news of the California gold rush spread throughout the land. He stayed in California for three years before returning to the farm. Horace and Clarissa had five children. Though I’m not sure why the cemetery was eventually named the Tripp Cemetery instead of the Tofflemire Cemetery; there are family members of both families buried there. Noah Tripp came to the area with his wife Sarah (Allen or Allis) in 1846 - at least by some accounts. One of their daughters Salome would marry Samuel Findley Tofflemire and their son, John C. Tripp married Mary E. Tofflemire, daughter to Jonas and Sally. Mary died in 1882 and was buried next to her parents. John married a second wife, Clara and they had five children. They are both buried in Belvidere. Sarah Tripp passed away and Noah married Mary Herrin on August 14, 1854. Though there are no records stating where Sarah was buried, both Noah and Mary are interred at Tripp. There are several children who are buried at Tripp Cemetery that show no other relatives listed. Whether their families moved from the area or were just buried in another location is not known. These are Mary Dailey, daughter of J. and J. Dailey who died in 1861 at the age of one year old. Angus Turner son of C.W. and A.J. Turner born in 1862 died September 1, 1863; and Florence Turner daughter of C.W. and A.J. Tuner born in 1865 and died September 15, 1868. These little cemeteries that dot Winnebago county roads are an important link to our county’s beginnings. Their stories are filled with interesting tidbits of history. It is an honor to walk in the footsteps of not only the people who have rescued these very important landmarks but also the pioneers who are buried in them. The Pioneers of Winnebago and Boone Counties, Illinois who came before 1840. Katherine E. Rowland. Gateway Press, Inc. 1990. Ancestry.com, see Noah Tripp, Jonas Tofflemire, Horace Dyer. Find a Grave:https://www.findagrave.com, see Tripp Cemetery. 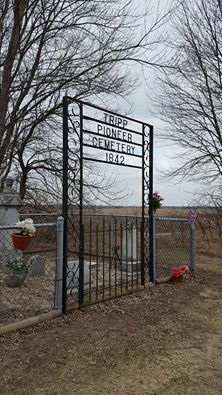 Winnebago County IL Archives Cemeteries, Tripp Pioneer Cemetery.